GM closed the doors of its Willow Run Plant officially last week, writing the final chapter in the story of a building with more history than you might think. GM's historic Willow Run plant located between Ypsilanti and Belleville, Michigan closed last week. The decision to close the historic plant was made as a result of company restructuring in the wake of bankruptcy. Although it was owned by GM when it closed the Willow run plant was initially built by Henry Ford during World War II. Ford built the factory on farm land he owned complete with a hangar and airstrip to meet the country's growing need for B-24 Liberator airplanes for the military. 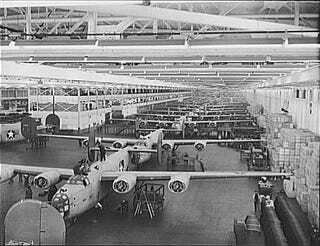 The first B-24 rolled out of the factory in October of 1942 and within 2 years Willow Run was producing 650 B-24s a month. In 1945 after the war ended, Ford sold the plant to independent car makers Henry J. Kaiser and Joseph W. Frazer. They used the plant to produce models such as the Henry J. In 1953 when Kaiser Frazer merged with Willys/Overland, the plant was sold to GM. Initially used to produce transmissions, GM used the plant to produce pickup trucks between 1956 and 1958, Corvairs throughout their 9 year production life, Novas and Caprices as well as various parts for GM vehicles. At its peak the 5 million square foot facility employed 5,000 people. When the company went bankrupt there were 1364 employees working at the plant. The building is for sale currently, although a production facility of its size in this economy will likely be a tough sell. The building was declared a historic landmark in 1980 by the Governor of Michigan at the time.